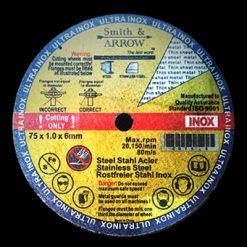 Shop our selection of 3″ 75mm Metal Cutting Discs Wheels for all Steel with 6mm Bore. Available in 1.0mm or .8mm thickness. Smith & ARROW Cutting Discs are Certified to Australian 5 Tick Safety Standards. Available in boxes of 25, 50, 100 and 200.